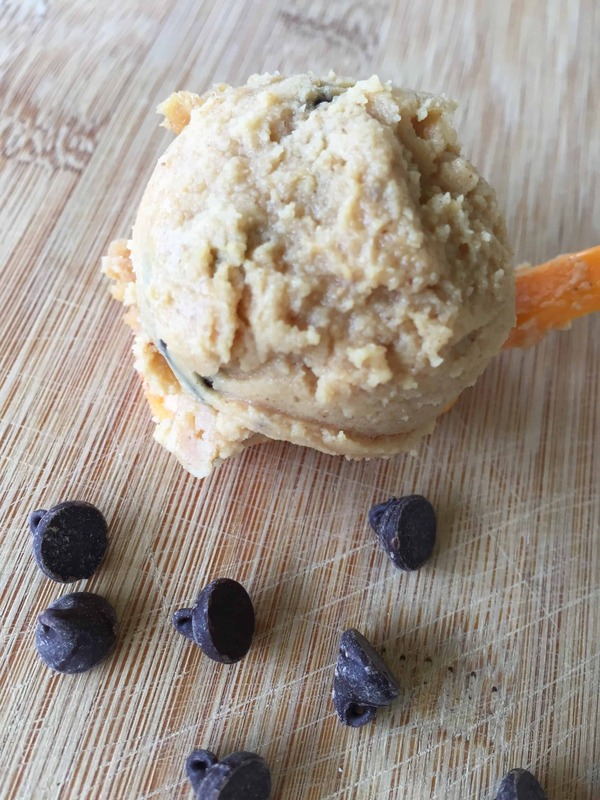 An edible peanut butter cookie dough with stevia-sweetened chocolate chips, and a good dose of health-promoting coconut oil! This recipe is low carb, sugar free, and a Trim Healthy Mama S Fuel. Honestly, who doesn’t like to eat cookie dough? I know, I know, they say you shouldn’t eat the raw eggs (THEY say – who are THEY anyway? ), but that has never stopped me from eating it by the spoonful! I should be ashamed . 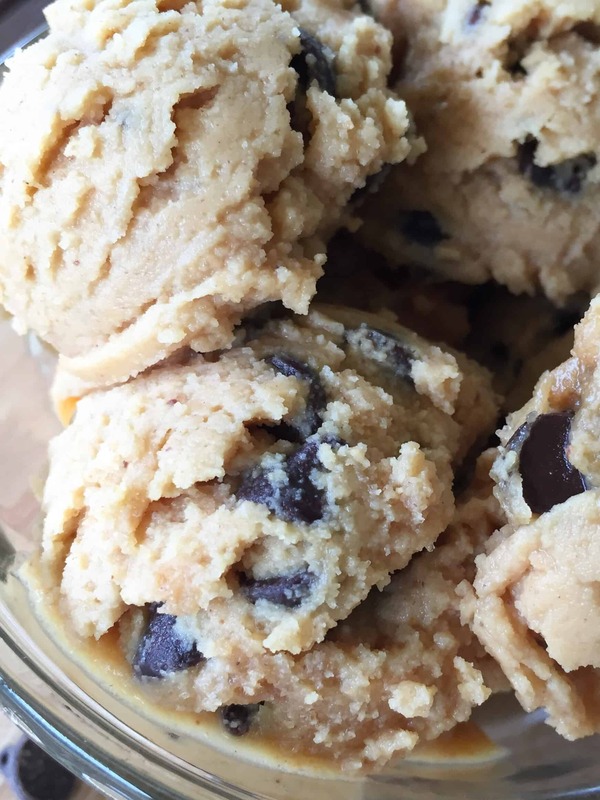 . .
Once upon a time I had tweaked a chocolate chip cookie dough recipe that was made only for eating – no baking! Today I went back to it and was trying to improve it before I posted it on the blog. THAT recipe requires some more work, but in the process I came up with this little gem! So, I present to you . 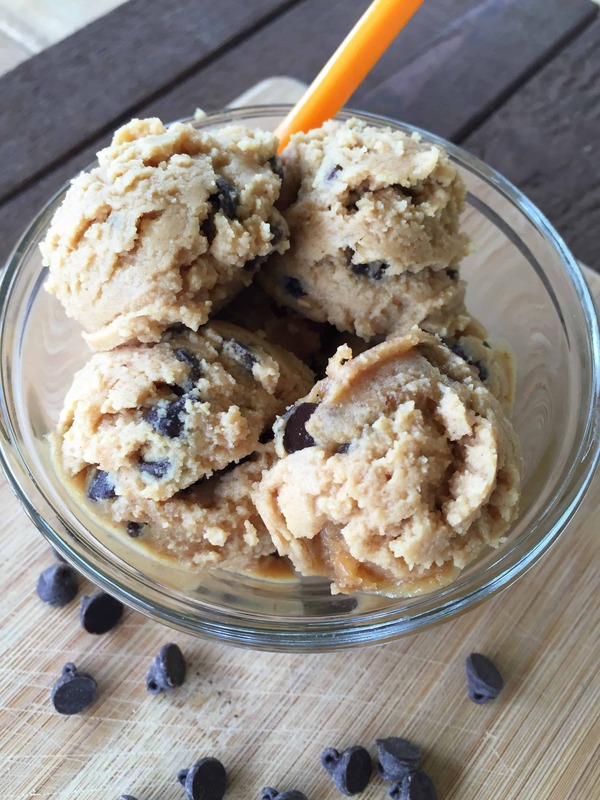 . . Peanut Butter Chocolate Chip Cookie Dough! Now I don’t have to be ashamed to eat cookie dough anymore! This makes 2 servings, but feel free to double or triple to have some for later! 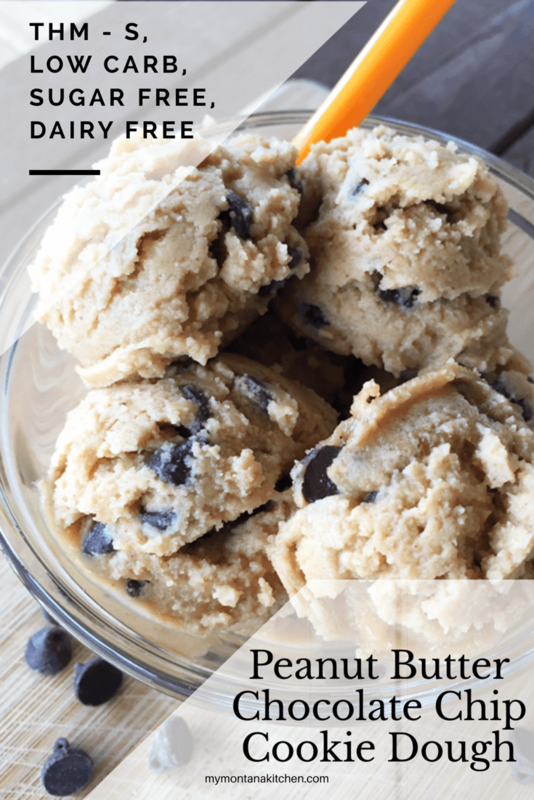 I originally made this with 2 Tablespoons of natural peanut butter (in place of the peanut flour) – that is amazing! But I wanted to try it with the Peanut Flour also – so it’s up to you which one you want to try! They are both delicious! The good news for me is that my husband doesn’t care too much for peanut butter – so this is a treat I can keep all to myself! Enjoy! Place in freezer for 3-4 minutes. Scoop into balls, or eat with a spoon! You should have a soft, wet dough. Placing it in the freezer will cause the coconut oil to begin to solidify. Take it out, give it a good stir, and you should be good to go! It will firm up if you put it in the fridge for a few minutes also (if you can wait that long!). My consistency was thinner and the color was darker than you have here, but WOW THIS IS AWESOME!!!!!!! I am allergic to coconut is there anything else that I can use? I would use softened butter in place of the coconut oil. it was awesome but i tried it with ghee also and WOW!! Loved this !!!! As a child we used to eat the cookie dough before it was baked. My favorite was the oatmeal cookie dough but that would be S and an E. Wouldn’t work. Oh well!! Thank you for sharing this recipe. Could you switch out the peanut flour for coconut flour? And also, if not that brand, could you use something like PB2? Peanut flour is what gives it the peanut butter flavor. PB2 usually contains sugar, but if that was not an issue for you, you certainly could use it! I don’t have the defatted peanut flour, can I use real natural peanut butter or will that just ruin the consistency? You can use natural peanut butter – the consistency may be different, but it will still be delicious! Are there any other brands of chocolate chips you can use that are on plan? Thank you! Lily’s is the only on plan brand, but I have used Hershey’s sugar free chips in a pinch. However, they contain malitol, which can mess up some people’s stomachs, so just be aware of that! ? This looks delicious! Do you have a recipe for this but in regular chocolate chip cookie dough flavor? Hey Saralyn! I’m so glad you liked it! And what a fun surprise to find a comment from you on my blog! This is delicious. I like it even better than the one you shared for Trim Healthy Table. Yummy!!! Hi…that cookie dough was delicious …I had chocolate peanut butter flour so used that instead…broke up some 85% chocolate bar to replace the chips. All very good, but a bit hard on the stomach. I believe next time I’ll use less gentle sweet. Delicious! I used 2 tablespoons of Truvia instead. Thanks for easy recipes like this to make to help stay on plan! Snack time is the hardest part for me. If using THM chocolate chip, is the amount the same? Yes, you would use the same amount. If I made this ahead of time and wanted to freeze it as a snack, could that be possible? We don’t have any chocolate chips. Is it okay to chop up skinny chocolate to add in place of the chips? Hi Sarah! Thank you for sharing this, LOVED it! 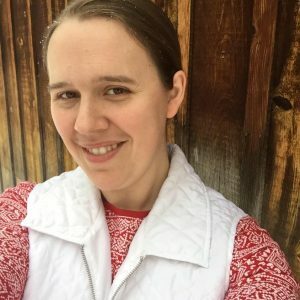 I’ve been doing THM for awhile now and just started a new blog where I talk about THM and other things. I’m not a recipe developer but am thankful for all of you who are. It’s so nice to be able to have so many options on plan! I wanted to drop by and let you know I linked to this recipe in a roundup post I made for healthy NYE foods. 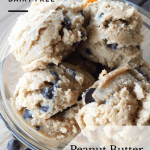 I made this tonight and added the new THM peanut butter extract and they were amazing!!!! Hi Vanessa, this is a single serve recipe, so I usually eat it all at one time. But you can make them ahead and keep them for a couple of days in the refrigerator.